In this tutorial you can find solutions to recover files from corrupted SD card as well as ways to repair corrupted SD card. If your SD card or flash drive is damaged or corrupted, you can follow this guide to fix it without losing data. SD card is one of the most common and popular storage devices used in modern society. It is small-sized but provides very large capacity, which enables it to be used on various digital devices such as smartphone, digital camera, e-book reader, etc. It helps users to hold all sorts of data like photos, videos, audios, documents and more. Files stored on the SD card get lost suddenly for no reason. Receive Read/Write error when you try to access data on SD card. SD card reports that it is write-protected though it is not when you attempt to write data to it. Partition on the SD card turns to RAW and it cannot be visited in Windows Explorer. The SD card is not showing up in computer after it is connected to PC via a card reader. File system corruption: If file system of SD card partition, the SD card will be inaccessible and reports error messages or become RAW. Bad sectors: Likewise hard drive, SD card also gets bad sectors. Bad sectors are not readable or writable, causing all kinds of issues. Improper operations: Many users tend to remove SD card directly without clicking the Safely remove hardware, or remove memory card while it is reading or writing data. Physical damages: SD card and other storage devices are vulnerable to physical damages, for example it can be blended easily. Besides it is not water-proof and can be damaged after dropping into water. Virus attack: Virus or malware is able to damage data on memory card as well damages the SD card itself. No matter the factors of the corrupted SD card, the first step you should do is recovering data if there are important files on the memory card. Corrupted SD card recovery can be done by data recovery software. 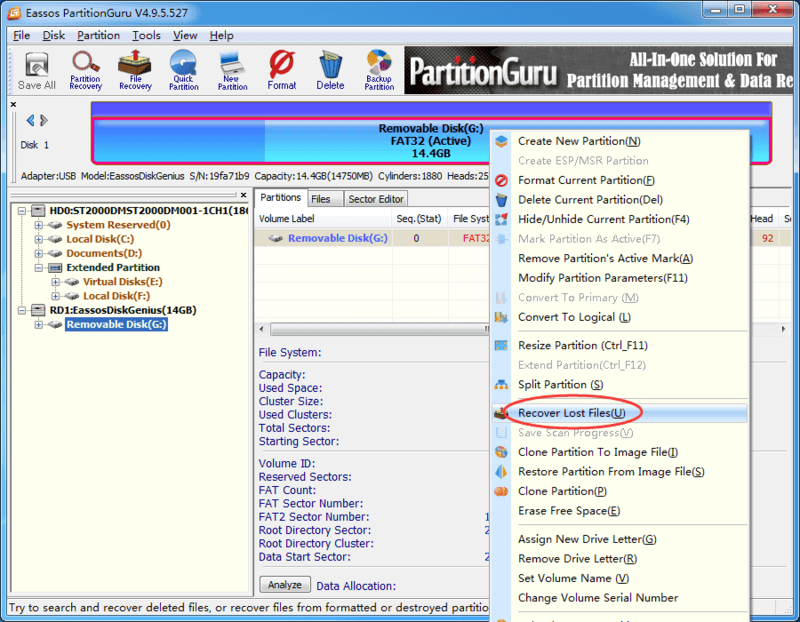 In this tutorial we recommend Eassos PartitionGuru Pro to recover data from corrupted memory card. Eassos PartitionGuru Pro is designed to be a versatile toolkit which is able to manage disk partitions, back up data as well as recover lost or deleted data for all kinds of storage device. You can view all partitions and device like Windows Explorer in the main interface, and the SD card recovery process is safe and simple. Step 1: Connect the corrupted SD card to your computer and wait until Windows can recognize it. Launch Eassos PartitionGuru Pro and you can see the SD card listed in the main interface. Step 2: Check if files on the corrupted SD card can be displayed in the software directly, if yes, you can view files and copy them to computer hard drive. If you’re not that lucky and the SD card damages badly, you need to scan the drive for lost data, then move to Step 3. Step 3: Right-click on the damaged SD card and click “Recover Lost Files” from the displayed menu. This opens the Recover Files window. Step 4: Select “Complete Recovery” mode and “Search For Known File Types” and click Start button. The software will starts to search for recoverable files on the memory card. Complete Recovery: This recovery option scans the entire memory card and tries to recover data with original names and directory structure. Search For Known File Types: This option performs a deep scanning for selected device so that it can find out as many files as possible. This recovery method analyzes and recovers data by file type. This recovery modes works if file directory on the SD card damages badly. Step 5: Preview recoverable files and locate what you want to recover. PartitionGuru allows users to preview photos, documents (MS office files, Text file, PDF, etc. ), audio and video file so that users can make sure whether files can be recovered correctly. Step 6: Recover files from corrupted SD card. Select files and folders you need to recover and right-click on them to choose “Copy To”. Then you can save selected data to another storage device. We’ve talked about corrupted SD card recovery and detailed steps to retrieve files from corrupted memory cards. You should be able to deal with corrupted SD cards on your own now. One thing should be noted that, if the damaged SD card is beyond repair or cannot be recognized by computer, you may need to contact professional to help you recover data. How to recover deleted files from SD card via free software? How to unformat SD card using free SD card recovery software? This entry was posted in Data Recovery and tagged corrupted SD card recovery, recover files from corrupted SD card, SD card data recovery software by EASSOS. Bookmark the permalink.